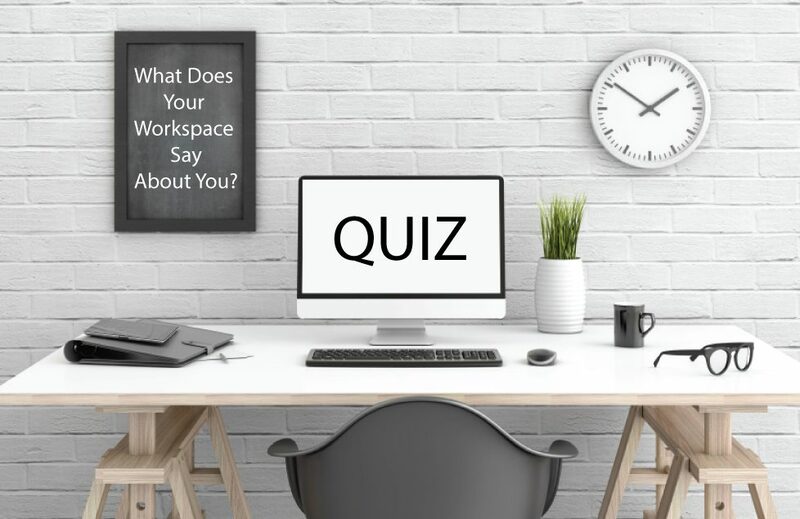 Quiz: What Does Your Workspace Say About You? Is your workspace a minimalist’s dream? Do you work best with a bit of chaos around you? Do you keep a plant at your desk or decorate with family photos? Everyone keeps a different type of workspace, and studies have suggested that your workspace can have a big impact on your work day from the idea that creativity can come out of a little desktop chaos to the idea that clutter can make it hard to focus. No matter what kind of workspace helps you function best, your desktop probably lets a lot of your personality shine through. So, what does your workplace say about you? How long do you keep informational pieces? A) I don’t, really. I have a couple of folders, but I’d rather just keep a digital copy. B) I keep most things on paper files. C) I keep the most important things under a photo paperweight. D) I have an external hard drive on hand that has backups of almost everything. E) I keep them until the project is over. A) I am admittedly less prepared than some of my coworkers, but I have what I need. B) When it comes to work-related preparedness, I’m always ready. D) I’m very prepared if a computer issue should arise. E) I do my best. What personal touches do you have at the office? A) I don’t really keep personal touches at my desk. B) I’ve got a few pictures tacked up on the wall. C) I’ve got plenty of personal items on hand to make things homey: some decorations and maybe even a house plant. D) My desktop background is always something fun. E) I’ve got a blanket or cardigan on hand at my chair (in the winter, sometimes both). Everyone’s work space could be improved a bit; how would you like to improve yours? A) I should probably dust. B) A new filing cabinet would be useful. C) I’d like a nicer frame for my family photo. D) Another monitor for my computer would be great. E) I’ve had my eye on an ergonomic chair. If one of your coworkers needs something, they might come to you; what do they come to you for? B) That file they don’t have a copy of. C) A mug for their coffee. D) A charger cable for their phone. E) Aspirin, tissues, cough drops, a spare stapler—I’ve got a drawer ready and waiting just In case they need something. You work best when things are uncluttered. While you are the most likely person in the office to be without a pencil (you didn’t like that mug of them cluttering your desk), your work space is always as neat as a pin. You probably work best when you’ve had a chance to lay things out at the beginning of the day. You don’t like to lose a thing—that’s why your filing cabinets are always so full. Your coworkers might be frustrated by your full-to-bursting desk, but you rarely are without the information you need. You probably work well on the fly. Your desk is an extension of your home, so you’ve made it as comfortable as possible. You’re very comfortable and can get to work easily—but a call from your spouse or a relative can easily knock you off task. You work best when you’ve made strong connections between yourself and your coworkers. You’re a fan of all things digital, and you probably have an impressive computer setup as well as chargers for all sorts of devices. You can work on a wide variety of devices and are always quick to find answers because of your tech. One challenge you face, though, is that if the internet or power goes down you have a harder time getting to work. Are your coworkers in need of a tissue? Do they need a pencil sharpener? Are they a little chilly because the air conditioning kicked in? You’re the person to ask. You want to keep yourself and the people around you happy and healthy, and you work best when you feel like you’re prepared. You might be easily distracted by others, though, because you’re always ready to lend a hand. So, what does your workspace say about you? We’d love to hear more in the comments below.